Author Tony HirstPosted on July 24, 2008 July 24, 2008 Categories Admin...2 Comments on OUseful.Info, err, 2.0? The context is/was a comment from Mike Ellis that HEIs et al. could start opening up their data by offering RSS feeds of news releases, job/recruitment ads and event listings, because there’s no reason not to…. So my, err, gift(?!) back to the IWMW community is a little something where UK HEI web managers can proudly show off how they’ve taken up the challenge and published a whole suite of autodiscoverable RSS feeds from their home pages ;-): UK HEI autodiscoverable feeds. 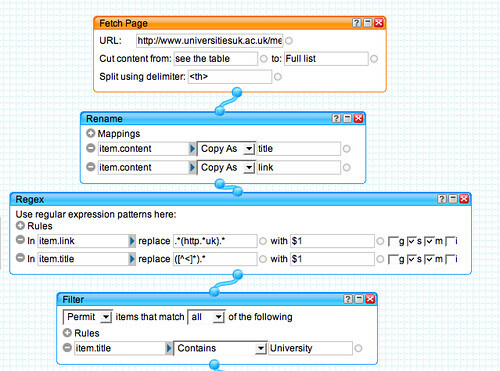 Any feed URLs that are autodiscovered are then added as elaborations to the corresponding HEI feed item. Although these elaborations aren’t exposed in the RSS feed output from the pipe, they are available in the pipe’s JSON output, so the half-hour (offline) hack on the train earlier this afternoon consumes the JSON feed and gives a quick and dirty show’n’tell display of which institutions have autodiscoverable feeds on their homepage: UK HEI autodiscoverable feeds. Looking at a couple of comments to the post Nudge: Improving Decisions About RSS Usage, (in which Brian Kelly tabulated the provision of RSS feeds from Scottish HEIs), it seems that publicly highlighting the lack of support for feed autodiscovery can encourage people to look at their pages and add the feature… So I wonder: when IWMW comes around next year, will the phrase No autodiscoverable feeds… be missing from the UK HEI autodiscoverable feeds page, possibly in part because that page exists?! 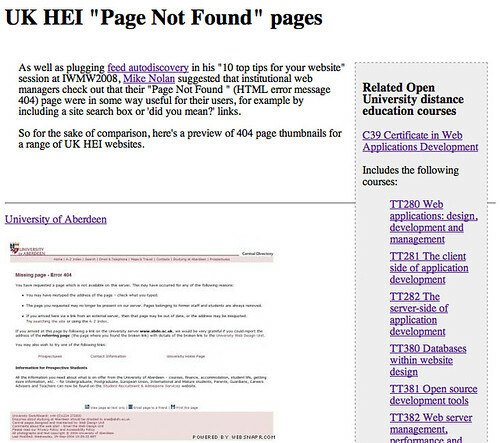 Over the weekend, I tweaked the code and created a parallel service that displays the ‘Page Not Found’ (HTML error code 404) splash page for UK HEIs using thumbnails generated using websnapr. The page takes in a list of UK HEI homepage URLs, generates a nonsense URL off each domain, and uses that nonexistent page URL as the basis for the thumbnail screenshot. 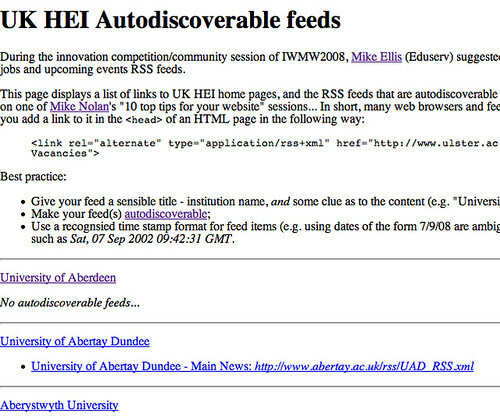 PS Brian Kelly pinged me with a note that he’s had a UK HEI 404 viewer around for just about forever… University 404 pages rolling demo… Just by the by, the script that Brian used to scroll through the pages was the inspiration for the original “deliShow” version of feedshow (about feedshow). Yesterday (err, Tuesday) I took part in a very enjoyable OU/BBC brainstorming session on “multiplatform ideas for a younger audience (17-24 yr olds)…as a new way of working for the future”. The session involved several time constrained (15 minute or so) sessions on set topics, in three groups of 8 so, with sharing back to the other groups after each session. 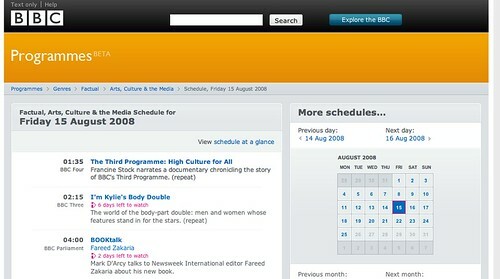 For example, the most popular channels are the ones that most people can get with the most popular soaps (and also follow the BARB reported trends), the most popular websites are guessable, (search, IM, social networking, a surprising one, online videos), big event shows are popular (as you can work out by looking back over BARB weekly viewing – the demographic probably skews things but just use a bit of nous when deciding whether it’s your dad or your daughter who’s likely to be watching…), most kids have a mobile phone, most of them send umpteen text messages a day, hardly any of them ever look at a newspaper. Something that wasn’t mentioned was that “younger viewers are particularly fond of going online while watching TV – over 20% of 16-24 year olds said this was something they always did.” (70% of TV audience goes online while viewing). Not surprisingly, none of us knew what the favourite OU courses were among 18-24 year olds, though I think the VC mentioned what percentage of our student population as a whole fell into that category. I also realised that I wouldn’t know how to even find out which courses in our Faculty, say, were most popular in terms of: a) raw numbers; and b) percentage of the overall course demographic. Any OU readers know the answer, or how to find out the answer? PS having a quick scout around, the only blogs I’ve found so far from others who were at the event are these occasional affairs: Mark Brandon (open2.net), Richard Williams, BBC Internet blog, Dan Gluckman. I have no idea whether anyone there twitters, or whether there are any others still (actively) blogging…? 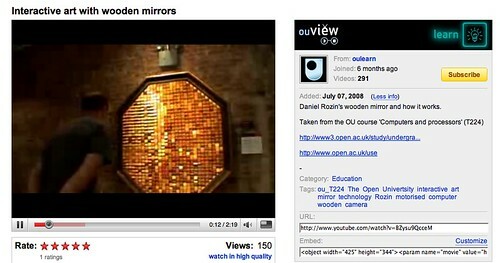 P…PS on the topic of Youtube, anyone know of OU courses other than T184 that are embedding 3rd party Youtube movies? So it seems like the revamped OU presence Youtube has gone live, with three channels (at the mo) and maybe another one to come if I read the greyed out Research icon right? 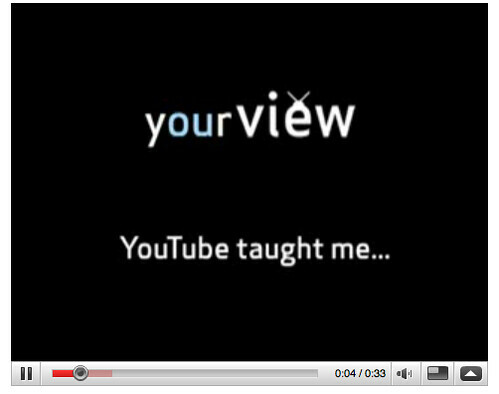 The main channel – which I guess establishes the ou view brand – appears to be home to ads and TV trails, and based on the old content that’s there is currently just a reskinning of the original OU presence on Youtube. The second new area (again with its own colour theme) is OU Learn, a collection of movies from OU course materials. 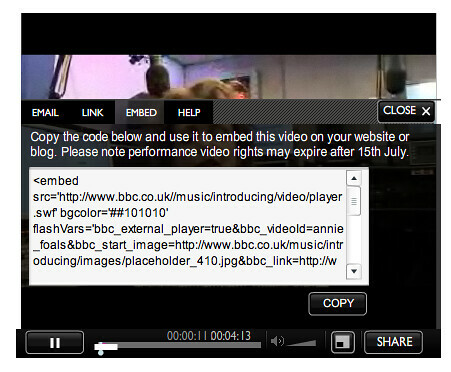 Anyway, if you’re not keeping up with iPlayer plays, here’s a good round up: BBC iPlayer 2.0: Links Roundup. 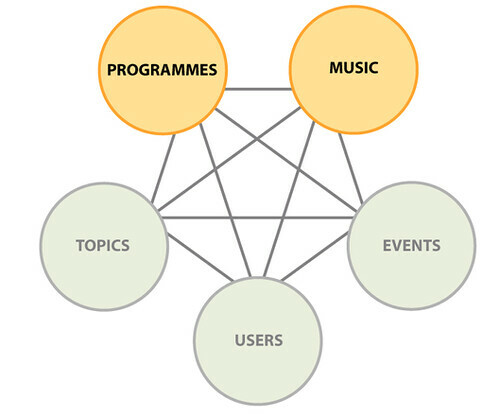 And if you’re into music, here’s another take on how the beeb sees music on the web: Sound Index. At the moment, the Sound Index artist pages don’t appear to match the BBC music artist pages (e.g. Foals (BBC Sound Index) and Foals (BBC Music, Artist pages, beta), nor does Sound Index use the MusicBrainz artist identifier that the Artist pages do in the URL, but maybe these services will merge in the near future? PS I’m going to be offline for a week or two, taking a bit of holiday, and catching up on some reading that’ll probably include BBC Trust – PwC Study into the economic impact of the BBC on the UK, Scoring Points and Making Money! The End of Linear TV Schedules? First up, it seems that someone’s picking at the linear schedule scab and looking for new ways to promote cross-channel content: When’s the sailing on? Introducing genre schedules…. so it’ll be interesting to see whether our agreement with the beeb goes so far as to allow OU co-pros to be defined as a genre in their own right! What else was there…? Oh yes, this was interesting: Martin Belam spotted that the Beeb are experimenting with ‘in-line text links’ (BBC News in-line text links trial out in the wild). I’ve been arguing for ages that we should be using the rather sleeker lightbox progressive enhancement for certain sorts of links, such as links to ‘optional’ Youtube videos, within our course materials… I guess I really should try to make a formal case, identifying the conditions under which we might want to open a link in an ‘overlayed’ frame, rather than the same window or a new tab, but that’s always for another day…! (That said, I have been using the approach “informally – e.g. follow the “Cheswick/Burch Map of the Internet” link on this page…. 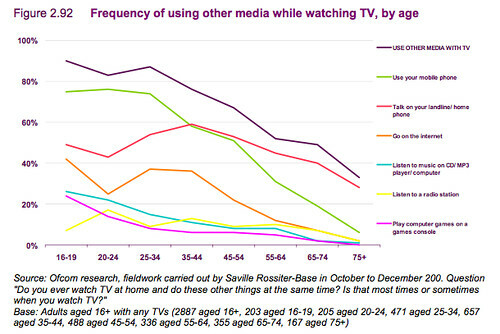 Like this for example – a stat showing how TV fails to completely hold anyone’s attention any more!